MORGANA RAE is an internationally acclaimed life coach, speaker and author of the international #1 bestseller Financial Alchemy: Twelve Months of Magic and Manifestation. Widely regarded to be the world's top Relationship with Money Coach, she has been featured on ABC-TV, PBS, NPR, FOX News Radio, United Press International and The Wall Street Journal online, and is frequently a featured expert on programs with Deepak Chopra, Marianne Williamson, John Gray, John Assaraf and T Harv Eker. Named one of 2012's Top Women in E-commerce by WE Magazine, Morgana has guided thousands of entrepreneurs, artists, healers and humanitarians to thrive in their purpose, attract more than they chase, and make things happen with ease, flow and synchronicity. The book launch is over, but I still want to give you a FREE GIFT. 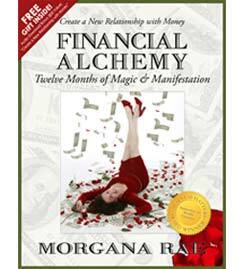 A FREE 2-hour audio class where Morgana will teach you Financial Alchemy secrets to get the very best results. © 2010 - 2013 Lynn Serafinn at Spirit Authors dot com. All rights reserved.